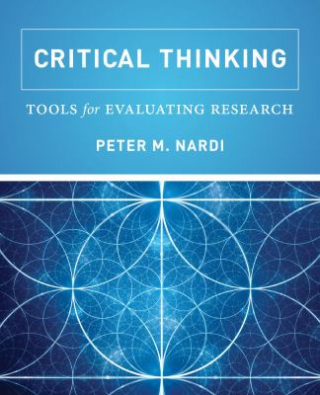 Critical Thinking : Tools For Evaluating Research - ubiq bookshop: the best place to buy books! Critical Thinking: Tools for Evaluating Research prepares students for interpreting information in a critical and thoughtful way so they can develop sophisticated levels of analyses crucial for understanding our increasingly complex and multi-mediated world. Peter M. Nardi's approach helps students improve analytical reasoning, develop insightful skepticism, and interpret and create reliable and valid research methodologies. The book emphasizes the creation of a toolbox of analytic skills enabling them to ask the right questions about the research and stories they hear or read about online, in the mass media, or in scholarly publications. Students are provided with ways to understand common errors in thinking; identify methods required to evaluate information and interpret results; understand social science concepts needed to make sense of both popular and academic claims; and communicate, apply, and integrate the methods learned in both research and daily life. Would you like to receive specials and newsletters?